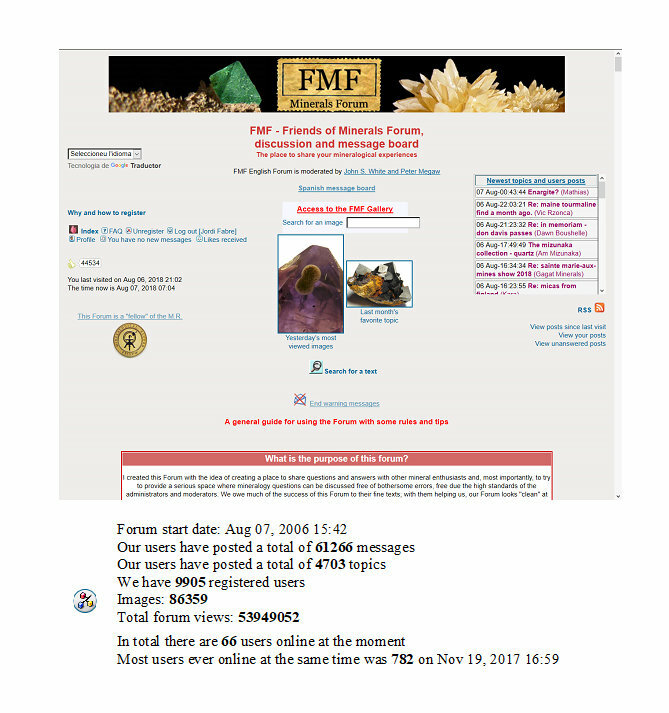 FMF - Friends of Minerals Forum, discussion and message board :: View topic - We celebrate the 12th anniversary of the beginning of FMF! We celebrate the 12th anniversary of the beginning of FMF! Posted: Aug 07, 2018 02:15 Post subject: We celebrate the 12th anniversary of the beginning of FMF! Today we celebrate the 12th anniversary of the beginning of this Forum. Long live to FMF! Posted: Aug 07, 2018 02:25 Post subject: Re: Today we celebrate the 12th anniversary of the beginning of FMF! To Jordi and his team - Congratulations on a job well done. Your time and effort is highly appreciated. All the best for the way forward. Posted: Aug 07, 2018 02:27 Post subject: Re: Today we celebrate the 12th anniversary of the beginning of FMF! Hi Jordi - congratulations! It is a great resource. I am busy working on the index for my forthcoming book on the Minerals of the English Midlands - very hard work, but it does mean that I am nearing the end of the project! Posted: Aug 07, 2018 05:35 Post subject: Re: Today we celebrate the 12th anniversary of the beginning of FMF! 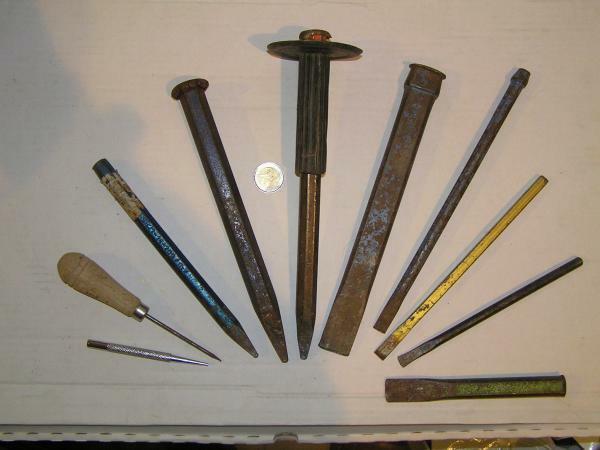 It´s very nice to enjoy with many mineral collectors around the world in this website. Learning everyday with the mineralogy doctors, is also gorgeous. Posted: Aug 07, 2018 06:09 Post subject: Re: Today we celebrate the 12th anniversary of the beginning of FMF! Your hard work will bring you a lot of scientific gains. Well done. Posted: Aug 07, 2018 06:26 Post subject: Re: Today we celebrate the 12th anniversary of the beginning of FMF! Posted: Aug 07, 2018 06:43 Post subject: Re: Today we celebrate the 12th anniversary of the beginning of FMF! Total forum views: 53955047. That's a lot of views. Some of the best collection photography on the interweb. Always civil and informative, Best advice John White ever gave me, "Join Jordi's site." Posted: Aug 07, 2018 07:17 Post subject: Re: Today we celebrate the 12th anniversary of the beginning of FMF! Congratulations to Jordi and his website forum! Twelve years young and going strong. BTW, Jordi is also a TV star. Last eve on our PBS channel, I saw Jordi on the Mineral Explorers show. It was the episode (repeat I think) going thru Spain to Navajun for pyrites. Posted: Aug 07, 2018 07:45 Post subject: Re: Today we celebrate the 12th anniversary of the beginning of FMF! Long live FMF, indeed! Thanks for all that you do to keep this forum vital and valuable. Posted: Aug 07, 2018 08:47 Post subject: Re: Today we celebrate the 12th anniversary of the beginning of FMF! Congratulations Jordi and the FMF team! Your hard work and dedication continues to pay off, and FMF has become on of the best resources online for mineral collecting and mineralogy! Keep up the great work, and thank you for all that you guys/gals do to keep things running smoothly! Posted: Aug 07, 2018 09:42 Post subject: Re: Today we celebrate the 12th anniversary of the beginning of FMF! Posted: Aug 07, 2018 11:02 Post subject: Re: Today we celebrate the 12th anniversary of the beginning of FMF! Congratulations Jordi and The Moderators, both on your staying power and on the service you provide to the community. Fabulous job...and here's to the next dozen! Posted: Aug 07, 2018 12:34 Post subject: Re: Today we celebrate the 12th anniversary of the beginning of FMF! CONGRATULATIONS !!! Jordi, Moderators, Site Administrators and FMF Staff. FMF has been a tremendous educational experience. Best wishes for many years to come. Posted: Aug 07, 2018 13:03 Post subject: Re: Today we celebrate the 12th anniversary of the beginning of FMF! More congratulations, Jordi, for creating and maintaining this Forum, and to all the staff & monderators and everyone! But, gosh, I'm writing this, but we may be in trouble if every one of the 9905 Forum registered users post likewise their appreciation to Jordi! Posted: Aug 08, 2018 03:05 Post subject: Re: We celebrate the 12th anniversary of the beginning of FMF! Hi to everybody! Congratulations for the very good job from Italy ad well! I hope it will last twelve times twelve Years more! Greetings by Riccardo. Hi! I'm a collector of minerals since 1973 and a gemmologist. On Summer I always visit mines and quarries all over Europe looking for minerals! Ok, there is time to tell you much much more! Greetings from Italy by Riccardo. Posted: Aug 08, 2018 04:15 Post subject: Re: We celebrate the 12th anniversary of the beginning of FMF! Let me add my feeble little voice to the choir:-) Congratulations Jordi!!! I feel privileged to be part of this forum. Posted: Aug 08, 2018 08:20 Post subject: Re: We celebrate the 12th anniversary of the beginning of FMF! Congratulations - and THANKS TO JORDI and all others who keep this great forum alive!!! Posted: Aug 08, 2018 11:59 Post subject: Re: We celebrate the 12th anniversary of the beginning of FMF! thank you Jordi and the other moderator, and member. This forum is a great source of knowledge and pleasure. Posted: Aug 13, 2018 08:48 Post subject: Re: Today we celebrate the 12th anniversary of the beginning of FMF! Posted: Aug 18, 2018 17:16 Post subject: Re: We celebrate the 12th anniversary of the beginning of FMF! Congratulations to Jordi and to all the FMF staff, site admins and moderators, but also to all the active participants! Actually you should receive congratulations every day for the way this forum is managed. FMF is a digital dinosaur but has never looked so lively.